Bridgeport Insulated grounding bushing is ideal for use on rigid and IMC conduits. This grounding bushing of trade size 4-inches, has die-cast zinc body construction for longer endurance. It measures 3-7/8-Inch ID x 4-13/16-Inch Dia x 13/16-Inch. 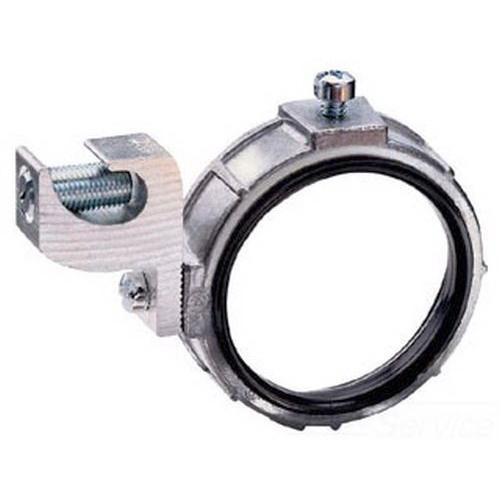 This grounding bushing is perfect for use with locknut to terminate service conduit to cabinet. The aluminum alloy 6061-T6 grounding lug of this nylon-insulated grounding bushing accepts conductors of size 14 - 1/0-AWG. It has plastic liner that efficiently prevents damage to wire insulation. Grounding bushing is UL/cULus listed, NEMA FB-1 rated, RoHS compliant and meets A-A-50553 Federal specifications.